ABC: GREY’S ANATOMY slipped 0.1 to 1.8, yet STATION 19 had a heartening 0.1 bump to 1.2. SCANDAL, airing for the first time this season at 10PM, fell 0.3 to 0.8. CBS: The line-up returned for the first time in 3 weeks following the NCAA Tournament break. THE BIG BANG THEORY (2.5), YOUNG SHELDON (2.0) and MOM (1.4) were all down 0.1, and LIFE IN PIECES dropped 0.2 to 1.0. SWAT was down 0.1 to 0.8. 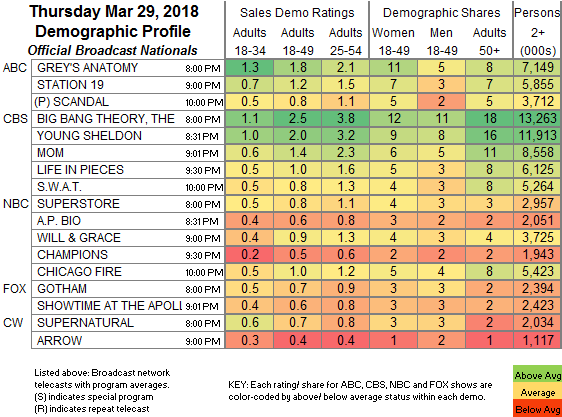 NBC: Facing BIG BANG again, SUPERSTORE slumped by 0.3 to 0.8, and AP BIO was down 0.2 to 0.6. WILL & GRACE returned from a week off down 0.3 to 0.9, and CHAMPIONS lost 0.2 to 0.5. CHICAGO FIRE was down 0.2 from last week’s 2-hour installment to 1.0. CW: SUPERNATURAL, returning from 2 weeks off with an animated SCOOBY DOO episode, rose 0.2 to 0.7, but ARROW remained at 0.4. CABLE HIGHLIGHTS: Sports led Thursday cable, topped by ESPN’s primetime MLB baseball game (branded “Sunday Night” for contractual reasons) at 0.61, and with 3 other games in the Top 20 at 0.38/0.32/0.29. TNT’s NBA doubleheader was at 0.49/0.48. On History, SWAMP PEOPLE dipped 0.03 to 0.34, and TRUCK NIGHT IN AMERICA was down 0.03 to 0.30. 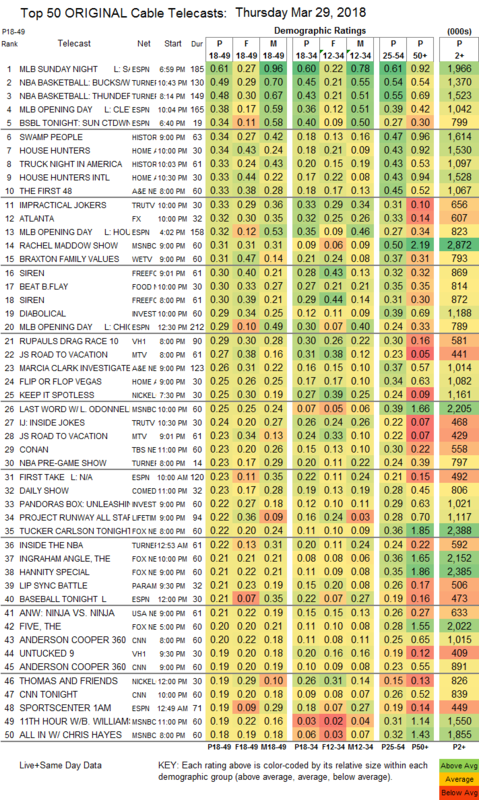 On HGTV, HOUSE HUNTERS rose 0.07 to 0.34, HOUSE HUNTERS INTL gained 0.06 to 0.33, and FLIP OR FLOP was down 0.05 to 0.25. On A&E, THE FIRST 48 was at 0.33, and MARCIA CLARK INVESTIGATES was at 0.26. Tru’s IMPRACTICAL JOKERS ticked down to 0.33, and INSIDE JOKES ticked up to 0.24. FX’s ATLANTA climbed 0.06 to 0.32. MSNBC’s RACHEL MADDOW SHOW led cable news in the demo at 0.31/0.50/2.9M, above Fox News’s TUCKER CARLSON TONIGHT at 0.22/0.36/2.4M and CNN’s ANDERSON COOPER 360 at 0.20/0.25/1M. On We, BRAXTON FAMILY VALUES lost 0.02 to 0.31, and HUSTLE & SOUL was down 0.05 to 0.16. Freeform’s SIREN had a solid start at 0.30/0.30. Food Network’s BEAT BOBBY FLAY rose 0.02 to 0.30. On ID, DIABOLICAL fell 0.04 to 0.29, and PANDORA’S BOX was down 0.05 to 0.22. VH1’s RUPAUL’S DRAG RACE fell a tenth to 0.29, and UNTUCKED plunged 0.16 to 0.19. MTV’s JS ROAD TO VACATION was at 0.27/0.23 compared to last week’s 0.23. Lifetime’s PROJECT RUNWAY ticked down to 0.22. Paramount’s LIP SYNC BATTLE ticked down to 0.21. USA’s NINJA VS NINJA also ticked down to 0.21. POP’s IMPACT WRESTLING ticked up to 0.10. TV Land’s NOBODIES returned at 0.06/0.05. CMT’s MUSIC CITY ticked up to 0.06.